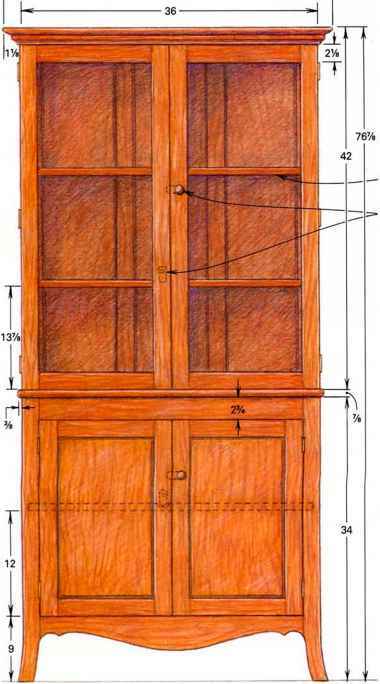 Figure 2 shows the assembly of the cabinet. Note that the cabinet top, back, and sides are all flush at the rear, and that the top overhangs the sides and front by 1/2 inch. The bottom fits inside the cabinet like a bottom shelf. Use glue and screws on all of the assembly steps, and countersink the screws. Place the back (B) between the two sides (A). Screw through the sides (A) into the edges of the back (B) using 1-1/4-inch-long screws spaced about 5 inches apart. Fit the bottom (D) between the two sides (A) so that it is flush with the lower edges of the sides. Screw through the sides (A) into the edges of the bottom (D) using three 1-1/4-inch-long screws on each side. Also use three 1-1/4-inch-long screws through the back (B) into the edge of the bottom (D). 4. Fit the top (C) onto the cabinet. It should be flush with the cabinet assembly at the back and overhang the front and sides by 1/2 inch. Screw through the top (C) into the edges of the sides (A) and into the edge of the back (B). Use 1-1/4-inch-long screws placed about every 5 inches.